More than half the world’s population live in cities, yet even as we gather closer in concrete clusters, our desire to be closer to nature is stronger than ever. James Fenner, whose consultancy, Silk Road, helps property developers “rewild” their projects by ensuring greenery features in their designs, says he finds people increasingly want homes connected to nature, not technology. Trees, flowers, grass and bushes are good for people’s mental and physical health, he says. “Being close to nature is better for all of us and should be embraced at every opportunity. If not, we’ll be surrounded by concrete and screens; Darwin would be appalled." A reinterpretation of Singapore’s much-loved “black and white” colonial bungalows, distinguished by their timbered frames and plastered walls, B House is a rare and visionary concept inspired by the past. Designed by Singapore’s Pomeroy Studio, the detached house is operationally carbon negative, because its solar panels produce more power than it consumes. By adopting traditional architectural features, such as roof overhangs and variable shutters, the designers are able to keep interiors cool. The completed building’s water-harvesting equipment saves 465 cubic metres of water from needing to be piped into the house from the mains. For its design, the architects were awarded the Building Construction Authority’s Green Mark Platinum Award, the highest recognition for environment-friendly buildings in Singapore. The Cork House features an imported cork tree—a symbol of resilience and intention—planted as the centrepiece of an outdoor entertainment area. The symbolism of the cork tree served as inspiration for the construction of the home, with the single tree integrated into the design early on. The new detached house features five bedrooms and various entertainment facilities, including a wine/tequila cellar and a projector room beneath the glass-bottom swimming pool. There is also 5,000sqft of patio space for al fresco dining and watching the sunset. Floor-to-ceiling glazing can be pulled back to create indoor-outdoor spaces, so occupants feel connected to the natural world outside. The US$28 million property is on sale through Sotheby’s International Realty. No garden outdoors? How about creating one indoors? This was the solution at a newly renovated three-storey mews house in Belgravia. A winter garden was installed on the top floor, forming part of a master suite that occupies the whole floor. The garden—with a retractable glass roof that means it effectively becomes a walled garden on warm days—links the master bedroom with its ensuite bathroom. The bathroom and bedroom have sliding floor-to-ceiling glazing, so occupants can open up all three spaces to form one free-flowing expanse. It can also be closed, while still being able to enjoy the view of the winter garden and t he light coming in through the glass roof. On sale through Knight Frank for £8.5 million, the freehold house has four bedrooms and two reception rooms. London is famous for its squares, where communal gardens are bounded by streets of houses whose occupants share these green spaces with each other. An ambitious new development in the heart of London’s Docklands plans to create an indoor version of the classic London square. At Landmark Pinnacle, architects Squire & Partners have included a 8,700sqft indoor garden for residents on the 27th floor of the 75-storey residential tower. The west side is designed as a calm space for relaxation, while the east side is intended as a playful landscape to ignite the imagination of children. 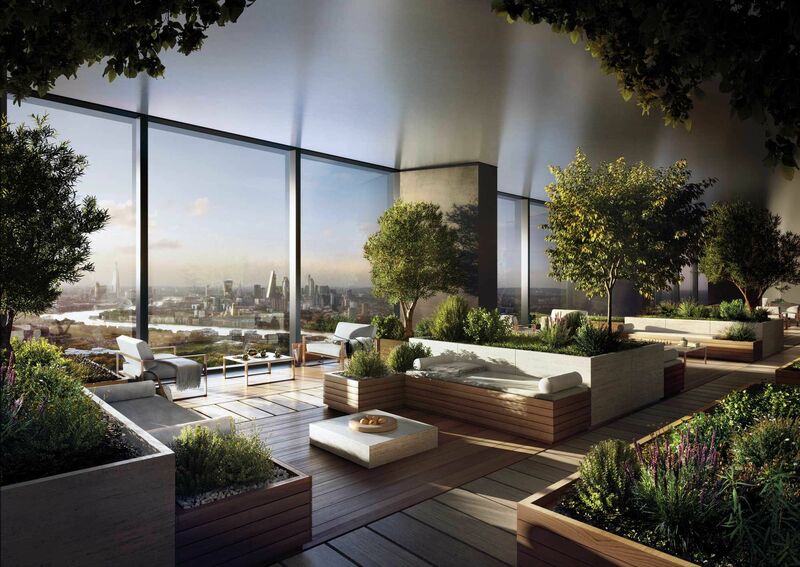 A roof terrace with 360-degree views crowns the building, taking in sights such as the O2 arena and Canary Wharf. The premium homes have three bedrooms and are on sale through Knight Frank for £1,550,000. Hong Kong architect Kevin Chu Yau-wing and his Italian wife, Giulia Dibonaventura, renovated their 1,293sqft Discovery Bay home with rubbish—in their bid to prove that beauty and eco-friendly aren’t mutually exclusive concepts. They laid particle porcelain tiles made from construction waste in the three-bedroom home, which they’ve named Eco 1, and used other sustainable materials such as cork to cover bedroom walls. The coffee table, for example, was made from bits and pieces collected while beachcombing. The couple installed house plants to filter the air, and air conditioning is rarely needed because roof insulation helps keep the interiors cool. Solar panels on the roof convert one day of exposure to the sun into 48 hours of lighting. One square metre of the roof is the home’s “farm,” supplying 60 per cent of the couple’s vegetables over a year. Nearby, a wall accommodates a vertical herb garden. This home, unfortunately, is not for sale. But it's definitely full of tips and tricks for turning your Hong Kong home into an eco-friendly oasis.